As you can tell from the screenshot above of (a selection of) responses on NaturalNews' Facebook post about this, reactions are all over the board from shock to denial and from outrage to insulted. Where do all these reactions come from? 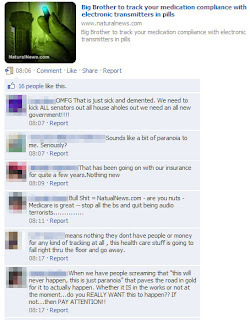 At face value, saying something like the medical industry being a Big Brother is indeed a fear-inducing title. Nobody wants anyone prying into their personal lives, let alone what diseases or infections they might have and what medications they're taking - and when, and how much. However paranoid as it sounds, and as shocking as it is, such technology apparently is being developed. Denying that it is or could be possible must therefore be out of the question. Before going further you'll have to ask what the benefits of the technology are. Cost is being touted as a primary reason for this technique; "to reduce the cost of Medicare by changing the way it pays doctors, who would be allowed to bill for Internet-based 'visits' with patients instead of in-person visits." I'm finding it difficult to imagine the cost savings of a high tech tracking system over the routine of just-taking-someone's-word-for-it. Not only is there the initial hardware cost of setting all this up, which must be at the very least "impressive" but there's the cost of maintaining it as well. Add into that the potential for corruption; there's going to be nothing stopping the medical industry from "checking in" whenever they feel like it, thus increasing the number of "visits" and sending the bill to the publicly-paid insurance. Since the government gets the bill who's going to check? Finally, and this is pure speculation, doctors' offices will still be packed because there just are some people out there who feel they need to be there; the line at the doctor's office is pretty much only limited by the actual number of people a doctor can see in a day. On the more disrespectful end of the responses you see people mudslinging NaturalNews for posting something that may frighten or alarm people. Is that warranted, I wonder? On one hand, many articles on NaturalNews.com do show a distrust of government, at the very least (although I am making no judgement on its righteousness by saying so). But skepticism seems only fair to the public when the public agrees with it. The negative reaction to this kind of story may qualify for the "ridiculing" part of the quote, “Every truth passes through three stages before it is recognized In the first it is ridiculed, in the second it is opposed, in the third it is regarded as self-evident," although it may already be strongly in the "opposed" category. So when it comes to stories like these, ask what is right and wrong about it; think about who the messenger is, but ultimately judge the information properly. In what situation is wireless, constant surveillance of prescription compliance warranted? Should doctors have the power to dose an adjustable amount of medicine remotely and without oversight? How much does such a system actually cost? How much will it be to maintain it? What happens if such a system is abused? Do the negative aspects outweigh the benefits? Personally, I think these questions are fairly easy to answer, and just having to answer them should at the very least make people raise a suspicious brow.